Hey guys, quick sweater update today. Anyway, that was a few days ago. 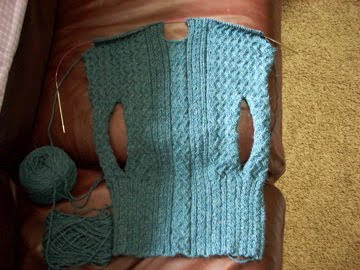 I was on such a roll with the sweater, but now that I know it's not the super perfect sweater I was hoping for, I sort of... well... stopped. Although the sweater fits him all the way around, as soon as you get to the point with his wide shoulders, he can't pull it closed. I have to knit a tiny border up the fronts anyway, so I figured I'd just make that a bit wider than called for before I sew in the zipper. It's another lazy, rainy day here in the Cities. I love it, but it didn't make for very good pictures, sorry. Did you guys hear that we had a tornado in Downtown Minneapolis yesterday?! It touched down right smack dab in the middle of the freeway and then proceeded to attack the Convention Center. Crazy. 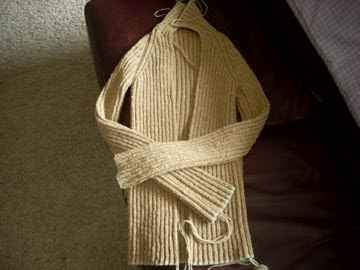 I'm so sorry that the sweater is giving you troubles at this late point. Can we blame your brother and his shoulders? Fingers crossed. I'm sure you can make it work. Delain has pockets too? You're brave. I am so sorry to hear about Franklin! That stinks. I hope you manage to salvage the project with out too much head ache. Aha! I'm glad Dave let us all know that those gaping holes in your sweater are pockets, not armholes. I just thought the top half of the sweater was reeeeeeally long! Ooooh, I hope that you're able to find the snap. I've done the same ting once, you're not alone. I think both are going to look great when they're done. We had a tornado out here once (Upstate NY) that turned a house on it's foundation a few degrees, just like you would a Rubik's cube. It was wild to see. Sigh. That's too bad. Hopefully you'll figure something out that will be workable. Glad you are safe from that crazy weather in your neck of the woods yesterday! Delain looks great, he must be appreciating the attention! Sorry to hear Franklin doesn't want to cooperate... I'm sure you can make it work, though. A slightly wider band might work well..
Delain is looking great!! I love that color.